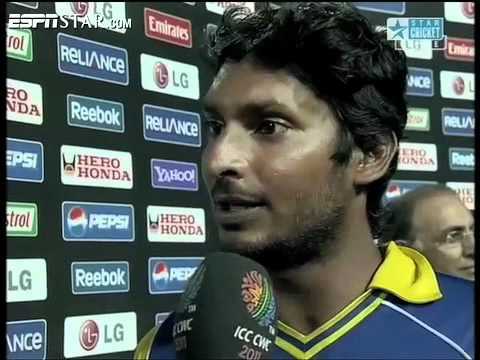 Watch Sri Lanka v New Zealand ICC Cricket World cup 2011 match Video Highlights. SL vs NZ match video highlights will be placed below soon after live broadcast of match. Sri Lanka beat New Zealand by 5 wickets to reach the final of the 2011 ICC World Cup. Tillakaratne Dilshan and Kumar Sangakkara scored half-centuries to provide stability to Sri Lankan innings in the middle. Tillakaratne Dilshan struck 10 fours while Kumar Sangakkara hit seven boundaries to help Sri Lanka register a 5-wicket win. Sri Lankan middle-order too struck some lofty shots reach 218 in just 47.5 overs. Lasith Malinga and Ajantha Mendis took three wickets each to bundle out New Zealand for 217 in the first semifinal of the World Cup. They were well supported by other bowlers. For New Zealand however no one really stepped up. Scott Styris scored 57 off 77 balls to take New Zealand to a respectable total of 217. New Zealand were bowled out in 48.5 overs. Lasith Malinga removed Martin Guptill, Kane Williamson and Nathan McCullum to claim three wickets. Malinga was expensive as he gave away 55 runs from his nine overs. Tillakaratne Dilshan carried on with his good form and scored 73 off 93 balls. Dilshan struck 10 fours and one six on the way. Kumar Sangakkara built an important partnership with Dilshan and struck a half century. He scored 54 off 79 balls which included seven fours and a six. Playing his last match at home in his national colors, Muttiah Muralitharan said that he was proud of his achievements and wanted to sign off in style by winning the 2011 World Cup semifinal against New Zealand. Kumar Sangakkara said that it is great to win the semifinal against New Zealand as it is the best send-off to Muralitharan. He added that everyone was pumped up to give a good home game to Muralitharan. He praised Muralitharan, calling him a legend and an ultimate team-mate. Russel Arnold said Sri Lanka’s bowling was surprising as they restricted New Zealand to an average score. Tom Moody feels that middle-order had a good outing and that will put them in a better situation for the final. Dont forget to watch video highlights of the match which is played between New Zealand & Sri Lanka teams?